Can’t quit comfort foods? Use these tips to lighten up your favorites. Choose Yukon Gold potatoes for their buttery flavor. And use low-fat buttermilk to get the health benefits of low-fat milk and a tangy kick, too. Use 1% low-fat milk instead of whole and just 6 ounces of cheese. 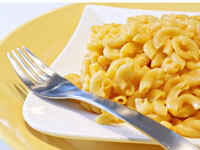 For a tasty, low-fat crust, top your mac and cheese with breadcrumbs.